UP is estimated to account for more than half of the country's $4-bn annual buffalo meat exports, says Ajay Modi. IMAGE: India earns more foreign exchange from buffalo meat exports than basmati rice ($3.48 billion in FY16). Photograph: Parivartan Sharma/Reuters. In the late 'nineties, an entrepreneur from the minority community faced a strong backlash from Hindu religious groups while trying to set up a meat-processing unit in western Uttar Pradesh. The Bharatiya Janata Party was in power then, as it is now. Kalyan Singh, the former chief minister of the state and the current Rajasthan governor, got the district magistrate concerned to issue demolition orders on the half-constructed unit. The entrepreneur ran for help to a top BJP personality at the Centre. Asked about the development, Singh informed the central leader that this plant would apparently slaughter thousands of cows daily. The central leader finally managed to pacify Singh by telling him that cows could not be exported in ‘matchboxes’. The plant, which processes buffalo meat for export, eventually came up after a delay. Now, it is facing a fresh crisis. Operations have been disrupted completely for the past few days because of an atmosphere of fear across the supply chain, since the BJP formed the government in the state after winning a historic mandate, with Yogi Adityanath as chief minister. One of the party’s election promises was shutting down illegal slaughterhouses. So far, allegedly illegal meat shops have been shut down in Lucknow, Varanasi and Ghaziabad. 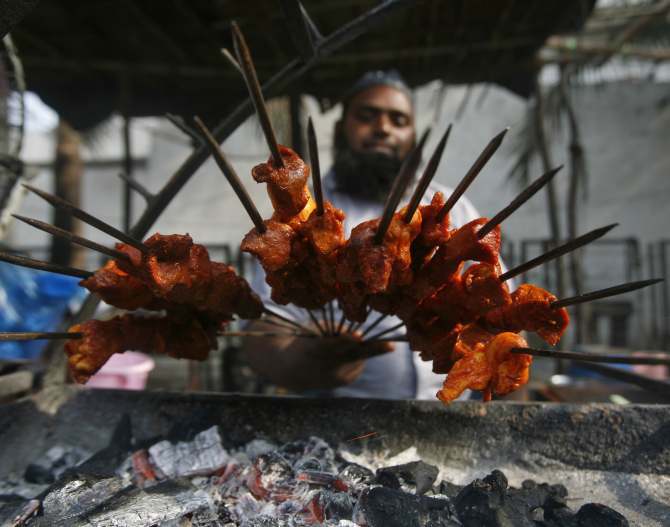 On March 21, at least three meat shops owned by Muslims were burned down in Hathras. UP is estimated to account for more than half of the country’s $4-billion annual buffalo meat exports. Its big markets are Vietnam, Malaysia and Saudi Arabia. In fact, India earns more foreign exchange from buffalo meat exports than basmati rice ($3.48 billion in FY16). Prime Minister Narendra Modi had attacked the United Progressive Alliance government during his 2014 Lok Sabha election campaign for promoting a ‘Pink Revolution’ by encouraging meat export. However, the BJP government at the Centre has not taken any action to discourage these shipments. Sirajuddin Qureshi, chairman and managing director of Hind Group, which owns two buffalo meat-processing units in the state, has been busy meeting his industry peers to evaluate the situation. “We have no concern if it is just about shutting down illegal slaughter units. But there must be adequate clarity and communication so that the organised sector is not targeted,” he said. The bulk of the buffalo meat processed in the state gets exported. According to the commerce ministry’s agricultural and processed food product export development authority, UP has around 180 buffalo meat-processing units, more than other key states such as Maharashtra and Punjab. Sirajuddin said the government should also introduce a system to let those who operate without licences apply for one if they comply with requirements. Illegal slaughterhouses have come up, as there were hardly any government-owned facilities. Hind Group is not the only one facing problems. Kanpur-based Rustam Foods has been unable to convince suppliers to bring buffaloes to the unit. “They are scared. They apprehend harassment if they bring supplies,” said Saleem Qureshi, the owner of Rustam Foods. Till now, there is no official order from the government to close slaughterhouses, and Chief Minister Adityanath’s actions are understood to be aimed at discouraging smuggling of cows. However, the sector is wary that crusaders would keep harassing even those dealing in buffalo meat legally. Some believe the crackdown had been initiated because most owners of slaughterhouses were Muslims. But others said this was a misconception. “There are packaging, administrative and technical staff at plants. Not all can be Muslims. There are a large number of transporters who are usually non-Muslims,” said a source. Industry executives said India had built an image of a reliable supplier of buffalo meat globally, emerging as the largest supplier in international markets after overtaking Brazil. “The world is watching whatever is happening in UP. This could impact orders,” said a source. Indian buffalo meat is preferred because of its competitive cost. It is especially sought after in West Asia and regions with a high Muslim population, since buffaloes are slaughtered here following the ‘halal’ method specified by the Quran. Many end up confusing buffalo slaughter and export with cow slaughter. Like agriculture, the slaughter of animals is a state subject. So, while cow slaughter is banned in most states, Kerala and West Bengal allow it. There is no ban on buffalo slaughter or its export, though globally this meat is also called beef. In India, only cow meat is known as beef.